Singapore Airlines' (SIA) long-haul low-cost subsidiary Scoot is preparing for a momentous 2015. The year will begin with the first 787 delivery and include the launch of approximately seven new destinations as Scoot’s fleet expands from six to 10 aircraft. Scoot unveiled plans on 9-Dec-2014 to launch services to Melbourne, its first route announcement in over a year. But Melbourne, which will be added in Nov-2015, will be the last (or one of the last) of several new destinations launched during 2015. While delivery of Scoot’s first 787 has been pushed back to Jan-2015, there have been no changes to the rest of the delivery schedule. Scoot plans to take 10 of the 20 787s it has on order in 2015. Its existing fleet of six 777-200s will be phased out after six or seven 787s are delivered. Scoot launched services in mid-2012 and currently serves 13 destinations (including Singapore) with a fleet of six 777-200s. After an initial 18 months of rapid expansion there have been no changes to the network and fleet over the last year. Such a long hiatus from expansion is unusual for a start-up LCC. But the decision to not pursue further growth of the 777 fleet and instead wait for the much more efficient 787 was sensible. Scoot’s original business plan envisioned a fleet of eight 777s by mid-2015. Scoot’s last destination, Perth, was announced in Oct-2013 and added in Dec-2013. Hong Kong, which was announced in Sep-2013 and added in Nov-2013, and Perth were made possible following the delivery of the carrier’s sixth aircraft. The two destinations use the same aircraft, enabling Scoot to offer convenient connections in the Hong Kong-Perth market. Hong Kong and Perth will also be the first destinations to be operated with 787s. Scoot now plans to take delivery of its first 787-9 in Jan-2015 and begin 787 operations on 1-Feb-2015. Scoot was originally slated to take delivery of its first 787 in Nov-2014. In Oct-2014 the delivery was pushed back to Dec-2014. Boeing recently informed Scoot of a further delay to the second half of Jan-2015 – most likely the third week of the month. The delays have been driven by a strike at Zodiac, the supplier of the economy seats on Scoot’s 787s. Zodiac employees were on strike from late Sep-2014 to late Oct-2014, resulting in aircraft delivery delays for several airlines. A further delay is not likely as the seats were recently installed on the aircraft and were certified. Scoot initially was planning to use its first 787 on the Singapore-Taipei-Tokyo Narita-Taipei-Singapore rotation. The Singapore-Perth-Singapore-Hong Kong-Singapore rotation was subsequently decided because of the intermediate stop in Singapore, which makes it easier to support should there be any issues with the first aircraft. The delay to the first 787 delivery is frustrating but there is some advantage with the revised schedule as it enables Scoot to use larger capacity aircraft during the peak northern winter season. Taking the aircraft around Christmas was not ideal. The new schedule will be easier for Scoot employees and better from a public relations standpoint as it falls after New Years but before Chinese New Year. As CAPA previously outlined, Scoot is configuring its 787-9s with 375 seats, including 340 in economy and 35 in business class. The economy seats will be configured in a 3x3x3 layout with 31in pitch (with exception of the Stretch seats). The business class cabin will feature recliner style seats with 38in pitch and 7in recline in 2x3x2 configuration. TIMCO is the supplier of the business class seats. WiFi and wireless in-flight entertainment will be provided by Panasonic. Scoot now plans to take six 787-9s in 2015, with deliveries scheduled from Jan-2015 to Aug-2015. It also plans to take four 787-8s in 2015, with deliveries starting in Sep-2015. Scoot is configuring its 787-8s with 330 seats, using the same suppliers as the 787-9. Five of Scoot’s existing 777-200s are configured with 402 seats, including 370 in economy (3x4x3 configuration) and 32 in business (2x3x2 configuration). ZIM supplied the seats for both cabins while Gogo was the WiFi supplier. Scoot decided against reconfiguring its sixth 777-200 and kept the aircraft in the original SIA 323-seat configuration, including 293 seats in economy (3x3x3 configuration) and 30 seats in business (2x3x2 configuration). There is no WiFi or wireless IFE available on this aircraft, which has been used over the last year primarily on services to mainland China. The sixth aircraft is leased from SIA while Scoot purchased the original five aircraft from SIA. Scoot is now looking to sell the five aircraft as they cannot be moved to new joint venture carrier NokScoot because Thailand does not permit the import of aircraft older than 14 years. Ironically Scoot’s sixth aircraft is now earmarked for NokScoot as it is slightly younger, 13 years old. Four of the five owned aircraft are 17 years old while one is 15 years old, according to the CAPA Fleet Database. Scoot perhaps would have reconfigured the sixth aircraft had it known it would end up at NokScoot. But when the decision was made to operate it in SIA configuration (the thinking was that the cost of the retrofit was not justified as the aircraft would only be at Scoot for one year) there were no plans for any affiliates. NokScoot was established in late 2013 and is now planning to launch services in 1Q2015. The new JV will operate ex-SIA 777-200s in 415-seat configuration, including 24 in business and 391 in economy. ZIM is also the seat supplier for these aircraft but NokScoot has decided against initially offering WiFi. Scoot plans to return the 293-seat 777-200 to SIA in Feb-2015 as it places into service its first 787-9. This 777 is now used on China services and will be replaced by a 402-seat 777 that is freed up by the transition to the 787-9 on the Hong Kong and Perth routes. This will enable an increase in capacity to China ahead of the Chinese New Year period, which in 2015 falls in the second half of February. The five 402-seat 777s will be replaced as the subsequent six 787s are delivered. Scoot had been planning to replace all six of its 777s with the first six 787s on a 1:1 basis. But Scoot is now looking at potentially operating the 777 slightly longer in order to spread out the capacity expansion over a longer period. If the 777 fleet was phased out as soon as the sixth 787 is delivered in Aug-2015 all the expansion for the fiscal year starting 1-Apr-2015 (FY2016) would come over the last seven months of the year (September to March). Scoot plans to take nine 787s in FY2016, with the fifth aircraft (seventh overall as the first two deliveries are in 4QFY2015) slated to be delivered in Sep-2015. The final delivery for FY2016 is slated for Mar-2016. By delaying the phase out of the 777 fleet until the eighth 787 is received Scoot can begin pursuing network expansion as early as June-2015. This would be easier to manage as it spreads out the expansion planned for FY2016 over 10 months instead of seven months. Adding a destination in Jun-2015 would also be ideal as June is a peak month in Singapore. So far Scoot has only announced one new destination for calendar 2015, Melbourne, which will commence on 1-Nov-2015 with five weekly flights. But Melbourne will not be the next destination Scoot launches. In fact Melbourne will be the last – or one of the last – of approximately seven destinations Scoot will add in 2015. The exact number of new destinations is not decided as Scoot has not finalised its network plan for 2015. Some potential new routes hinge on slots and traffic rights. The exact number of new destinations Scoot is able to launch with the four additional aircraft also hinges on whether the new routes are operated daily or less than daily. The exact number of routes Scoot is able to launch in 2015 also hinges on the length of the new routes. While Scoot primarily is focusing on medium-haul routes of five to eight hours it is looking at potentially adding more short-haul flights. Bangkok and Hong Kong are currently Scoot’s only routes under four hours. Scoot could potentially take over some short-haul flights that are now operated by sister short-haul LCC Tigerair. Tigerair is discussing handing Scoot traffic rights and slots covering routes or particular frequencies where demand is sufficient for a widebody aircraft. Scoot and Tigerair in Aug-2014 secured anti-trust immunity from Singapore competition authorities. The two carriers have since begun coordinating sales, marketing and revenue management while tweaking schedules to maximise connections. Scoot is starting to see a larger share of transfer traffic with Tigerair, albeit from a very small base. Connecting traffic is a critical component of the Scoot model and will particularly become important in 2015 as Scoot pursues rapid network growth that is not sustainable by relying entirely on the local Singapore market. The Scoot-Tigerair alliance includes the two carriers discussing potential new routes for both carriers. New routes to mainland China are expected to account for most of the capacity Scoot is adding in 2015. Scoot currently serves four destinations in mainland China with 11 weekly flights. This includes four weekly flights to Nanjing, four weekly flights to Qingdao and three weekly flights to Tianjin. Two of the four Qingdao frequencies continue onto Shenyang. Scoot is looking to add up to four new destinations in China in 2015 while adding frequencies to its existing four destinations. The 787-8 is seen as an ideal aircraft for China, enabling more frequencies and new routes. Scoot eventually also plans to decouple Qingdao and Shenyang although non-stop flights to Shenyang are not part of the plan for 2015. Scoot’s preference it to operate non-stops and none of its new Chinese destinations for 2015 will be tagged. Scoot has been looking at several potential new Chinese destinations. Securing desirable slots will be a factor in the forthcoming decisions. Scoot will significantly increase its share of the Singapore-China market in 2015. Scoot currently accounts for only about a 7% share of total seat capacity between Singapore and China. 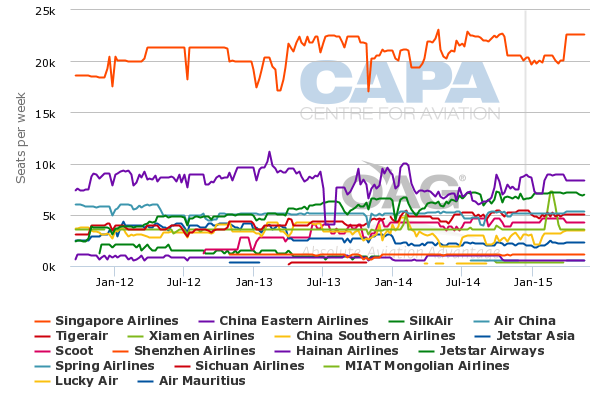 SIA accounts for a leading 33% share while LCCs in total account for only 19%, according to CAPA and OAG data. There are huge opportunities for Scoot to grow in China. Smaller markets such as Qingdao and Shenyang take time to develop but the SIA Group can afford to be patient with Scoot as such markets mature gradually. As Scoot expands its Chinese network the focus will continue to be on secondary markets. The SIA Group’s strategy for China has been to use Scoot to open new markets which are not already served by other airlines in the Group. The strategy for other markets, including Australia, has been different with Scoot used alongside the SIA brand. The SIA Group could potentially adjust its China strategy and use Scoot on a primary route as a response to intensifying competition from Chinese carriers. Scoot could be a more effective competitor against Chinese carriers – a scenario SIA is contemplating while still primarily using Scoot to open new markets. Australia will also see further growth in 2015. But Scoot plans to launch only one new destination in Australia in 2015 – Melbourne – while China will see several new destinations. Australia is currently Scoot’s largest market, accounting for about 38% of its ASKs compared to 22% for China, according to CAPA and OAG data. Scoot currently operates five weekly flights to Perth, five to the Gold Coast and seven to Sydney. Scoot reduced off-peak capacity to Australia in 2014, with frequency reductions to all three destinations and tagging Gold Coast with Sydney on certain middle of the week flights. Scoot is confident market conditions will improve in 2015, enabling the carrier to restore its original Gold Cost and Sydney schedules and launch Melbourne. Perth will also be upgraded to daily from 1-Feb-2015 as the route transitions from 777-200s to 787-9s. 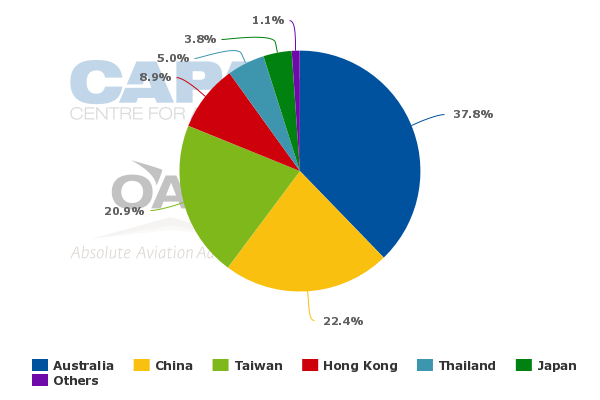 Scoot currently has about an 8% share of seats between Singapore and Australia, according to CAPA and OAG data. 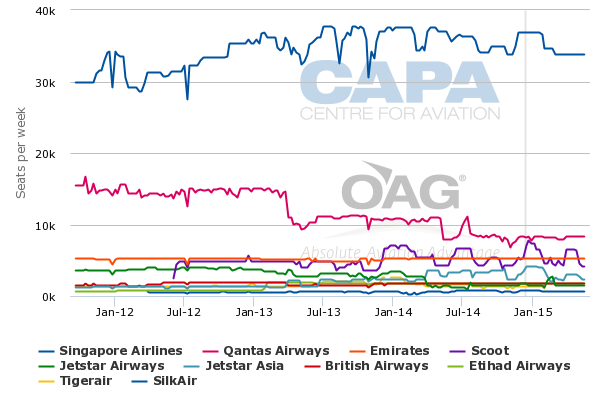 SIA has a leading 55% share while the Qantas Group has about a 20% share. Qantas partner Emirates also has about an 8% share. Scoot has looked at Melbourne for some time and has already started ticket sales for five weekly flights beginning 1-Nov-2015. Such a long lead time is unusual but is sensible as the Singapore-Melbourne route is highly competitive, with services from Qantas, Jetstar, Emirates and SIA. Scoot wanted to space out its new route announcements for 2015 and decided Melbourne was the best one to announce first although several routes will be added earlier. The other new routes are not as competitive, making it easier to start ticket sales with shorter lead times. Secondary routes to China in particular would not significantly benefit from long lead times. Everything was also in place to announce Melbourne as Scoot has been talking to Melbourne Airport for a couple of years. While it was ready and eager to announce Melbourne it was sensible to wait for the peak southern summer season to begin the route. Scoot has the capacity to launch Melbourne during 3Q2015 but that is not the best time to launch a new route to Australia, particularly given the recent unfavourable market conditions in the Australia-Southeast Asia market. Scoot is not ready to announce other new routes. But it should be ready to unveil a string of new destinations after it completes the milestone first 787 delivery. Introducing a new aircraft type and launching several new routes will be challenging. But transitioning to a more efficient aircraft type and expansion, which will result in better economies of scale, is essential. Scoot plans to slow expansion from 2016 as the last nine of the 20 787s it has ordered will be spread over a much longer period than its first 11 deliveries. Scoot is not slated to take its 20th 787 until the fiscal year ending 31-Mar-2019. Scoot has a total of 10 787-9s and 10 787-8s on order, with the first six and last three deliveries all being -9s. Scoot took over SIA’s 787-9 order in late 2012 and subsequently converted 10 of the orders to the smaller -8. Scoot was able to push back several deliveries in the second part of the order but there was less flexibility with the initial deliveries, resulting in the rapid expansion rate for 2015. In a perfect world Scoot would have had faster growth in 2014 and slower growth in 2015. But Scoot in 2015 will reach a point in its development where it should be able to support rapid growth. The Tigerair partnership and the transition to the 787 are game-changers that provide a potential platform for long-term profitability (and growth). Losses in the initial phase were always anticipated. More losses in 2015 are inevitable as there will be one-time costs associated with the fleet transition and it will take time for the new destinations to mature and the additional capacity to be absorbed. But Scoot is a long-term play for the SIA Group with 2015 being a year of strategic importance.